The off-grid pioneer expands from simple lighting to more holistic solutions. Solar lantern startup d.light design is licensing its pay-as-you-go financing to its partners and distributors across the globe to scale the reach of its solar lights and home systems. At over a decade old, d.light is a pioneer in the burgeoning market for off-grid solar solutions. Its most recent funding round in 2014 raised $11 million, a considerable sum at the time for off-grid solutions. Since then, companies such as Off Grid Electric and M-Kopa have raised far more, and the industry topped $200 million in financing in 2015, up from about $60 million in 2014. For now, d.light’s sales are still primarily for solar lanterns, some of which have a mobile-phone charging option; only a small fraction are solar home systems. The company has sold more than 14 million solar lanterns and about 250,000 solar home systems across more than 60 countries. The licensing of its pay-as-you-go platform is meant to help build up the business for its larger home systems while also expanding the reach of its lights. “The market is so vast that partnerships are key to scaling operations,” said Karl Skare, d.light’s director of new business initiatives. Partners in six countries are already using d.light’s Atlas pay-as-you-go system, including mobile operator Digicel in Haiti and energy giant Total. Now all local partners will have access to it. The company expects to double the number of licensees by the end of the year. The partners will have access not only to the payment system, but also to technical support, customer support and inventory management tools. Mobile payment options and pay-as-you-go are essential to the uptake of off-grid energy solutions. While d.light is best known for its work with lanterns, it was a pioneer in launching its home solar system back in 2011. The solar home system comes in 5- and 10-watt models. The smaller system comes with two lights and wall switches, a mobile-phone charger and a portable lantern. The larger system has an additional light, flashlight and radio. The company is also pioneering energy-efficient off-grid appliances, such as its off-grid solar TVs, which won an award at the Global Leap Awards in June. Today, the solar home system market is scaling quickly across the globe, with new startups and increased investor interest. Off Grid Electric raised $70 million last year alone for its micro-solar leasing platform, which is available in certain African countries. M-Kopa has raised about $65 million for its solar home systems, half of which was garnered in the past 18 months. By comparison, d.light has raised about $40 million in capital since 2008. For most off-grid startups, the investment rounds are still much smaller. PEG, the leading off-grid pay-as-you-go solar company in Ghana, for instance, just raised $4.3 million in a Series A-2 round led by Energy Access Ventures. With a far larger footprint than most up-and-coming competitors, d.light has the advantage of being an early mover. 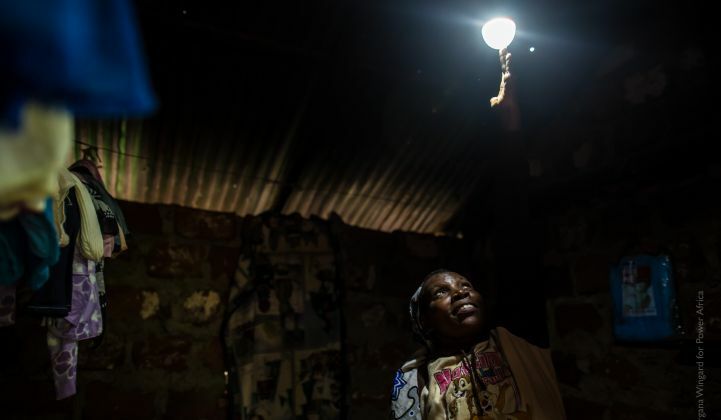 But as the appetite for modern energy grows, lighting and small solar systems that can charge a handful of appliances in a house or small business may not be enough, which will leave plenty of head room for off-grid companies to innovate, or stumble, as they work to electrify the 1.2 billion who live without access to modern electric services.